If you're all about feeling relaxed when it comes to fashion, this combination of a black leather biker jacket and a JULES KAE jen faux fur pouch from Nordstrom is right what you need. And if you want to instantly up the style ante of your look with one piece, add black leather ankle boots to the equation. If you're all about comfort dressing when it comes to your personal style, you'll love this totally chic pairing of a camel coat and a JULES KAE jen faux fur pouch from Nordstrom. Bump up the cool of your getup by completing it with black chunky leather ankle boots. 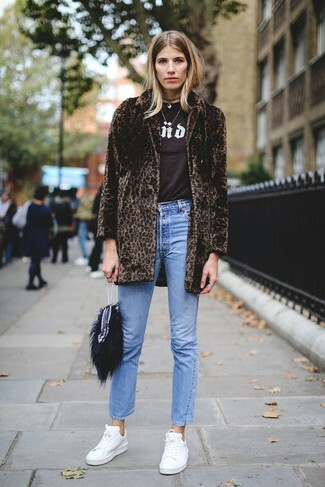 If you're obsessed with practicality dressing when it comes to your personal style, you'll love this chic combination of a dark brown leopard fur coat and a JULES KAE jen faux fur pouch from Nordstrom. A pair of white leather low top sneakers fits right in here. If you're a fan of functionality dressing when it comes to fashion, you'll love this stylish pairing of a black coat and a black fur clutch. To add oomph to your outfit, finish off with black leather ankle boots. If you're all about relaxed dressing when it comes to your personal style, you'll love this chic combo of a black open cardigan and a JULES KAE jen faux fur pouch. Sporting a pair of black suede platform loafers is a simple way to add some flair to your ensemble. If you're a fan of functionality dressing when it comes to your personal style, you'll love this super cute combination of a tan bomber jacket and a JULES KAE jen faux fur pouch. Kick up the cool of your look by complementing it with black cutout suede ankle boots. If you're all about relaxed dressing when it comes to fashion, you'll love this chic pairing of a black long sleeve t-shirt and a JULES KAE jen faux fur pouch. Lift up your getup with black suede pumps. 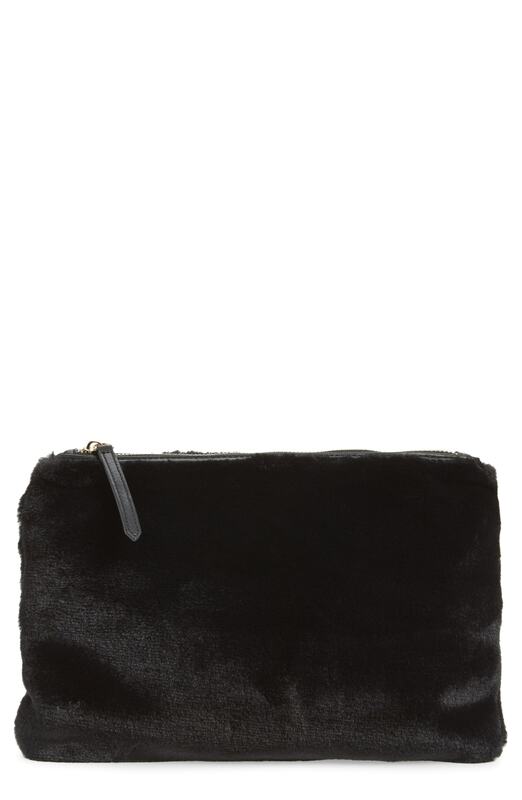 Marry a black crew-neck sweater with a JULES KAE jen faux fur pouch to be both knockout and relaxed. A cool pair of black cutout leather ankle boots is an easy way to upgrade your look. If you're obsessed with relaxed dressing when it comes to your personal style, you'll love this adorable combination of a dark green coat and a JULES KAE jen faux fur pouch. With shoes, rock a pair of black leather chelsea boots.